George Blathwayt was born the son of William Blathwayt, a clergyman at the rectory of Langridge 1 near Bath on 25th February 1797. He joined the 23rd Light Dragoons as a Cornet in 1814, becoming a Lieutenant on 4 May 1815; serving with this short lived regiment through until its disbandment in 1817. The 23rd Light Dragoons originally started life in 1794 as the 26th Light Dragoons whose uniform was a dark blue jacket and all facings in the same colour; the 23rd Light Dragoons raised at the same time was an Irish corps with red facings to their blue jackets. As the 26th Light Dragoons, they served in the West Indies 1796-7, Portugal 1798-1800 and Egypt in 1801. With the Peace of Amiens in 1802, there were reductions in the size of the army and the 23rd Light Dragoons were disbanded, reputedly because of the poor discipline of this Irish corps. The 26th were therefore renumbered to the 23rd and were given the uniform of the previous 23rd with red facings on their dark blue tunics. As the 23rd they gained further honours at Corunna and Talavera. At Talavera the regiment stood on the left wing of Wellingtons army and became famous for its charge against Ruffin’s Division which although disastrous to themselves, succeeded in preventing the French turning the flank of the position. After this, the regiment spent a long period in England, where the government regularly used dragoons to make up for the lack of a police force to quell disturbances during a period of shortages, high prices, industrial and social unrest. When George joined the regiment, there was little sign of a change in their role as the war had just ended and Napoleon had been safely removed to the island of Elba. However, everything changed dramatically in 1815, with the return of Napoleon. All of Europe declared against him, the Duke of Wellington was given command of the Allied army in Belgium and the government sought every unit they could spare to reinforce him. 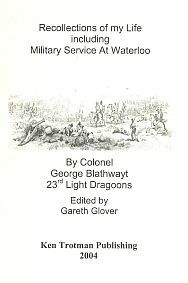 The 23rd Light Dragoons were one of these regiments hurried to Belgium and Lieutenant George Blathwayt went with them. George served throughout the Waterloo campaign and subsequent advance to Paris luckily without injury. The regiment soon returned home and having been converted to lancers in 1816, they were promptly disbanded in 1818. It seems that sensible control of defence spending has always been an issue! It appears that George was placed on half pay and never saw active service again. He very aptly married Mary Anne Agmondisham-Vesey, the daughter of a clergyman, on 21 January 1822 and had issue. By 1851 he had risen to the rank of Lieutenant Colonel on the retired list and died on 14 May 1871. George wrote this account of his life at the request of his children and therefore there is much on his early life in Bath, Bristol and London or more precisely the village of Mary-le-Bone. This early social history is interesting and sheds some new light on life in England at this time. However the greatest interest in this account is the period George spent with the 23rd Dragoons, particularly for the Waterloo campaign and its conversion to lancers in 1816. Its importance is further increased by being only the second memoir to have been published from this short lived regiment, the other being the account of Veterinary Surgeon John Shipp who served with the 23rd Light Dragoons from 1806-18. John Shipp however is unfortunately silent regarding the Waterloo campaign; this memoir by George Blathwayt is therefore a significant account of a long forgotten unit.